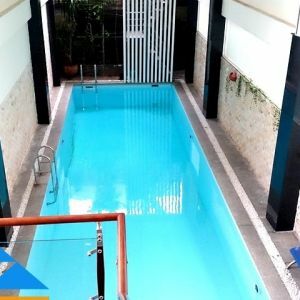 Serviced apartment is located on Dong Nai street in Tan Binh district, residents will enjoy plenty of new life experience with senior utility services. Serviced apartment for rent in Tan Binh district has 1 bedroom and separate living room, fully furnished kitchens in an area of 50m2. Kitchen with wooden shelves for storing food. In addition, there is necessary equipment such as fridge, gas stove, … and dining table to ensure the comfortable life for your family. The bedroom has a bed, wardrobe, air conditioning. It is decorated with exquisite curtains sunscreen helping you free to enjoy the moments of comfortable rest.